I had breakfast with my friend Susan yesterday who was recently in Northern Ontario visiting a her friend who owns a vintage store (lucky girl). 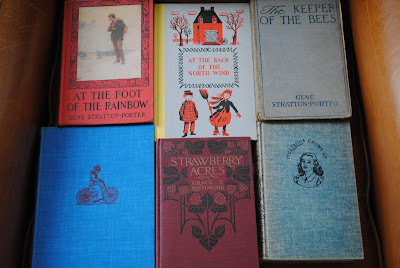 Susan went to some auctions with her friend and she bid $3 on a random box of vintage books for me! What a nice surprise and how sweet of her to think of me while she was on vacation. I usually pay $3 per book and sometimes close to $5, but won't go over that unless it is very special so $3 for a box of books is just incredible! I may need an East Coast book buying road trip when I run out of my currant pile of books - I think it might be worth my while...(a gal's gotta have a dream right?). 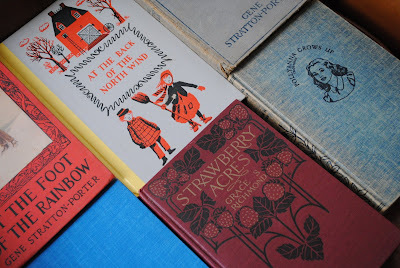 The other cool thing about these books, Susan knew exactly what to look for (cover, binding, etc.). I have shown a couple of my friends what to look for so I have some "scouts" out there. I also have a fun idea for those vintage photos I got last week - they will be incorporated into my books, I will take photos when I am done with my next book so you can see. Between the photos and these new books, I think I am ready to drive out of the creative cul-de-sac I have been in for the last couple months. Yes, I know! You may own this book one day my friend!